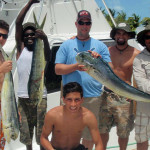 BocaChicaCharter invites you for fabulous sport fishing trips in the Caribbean sea. 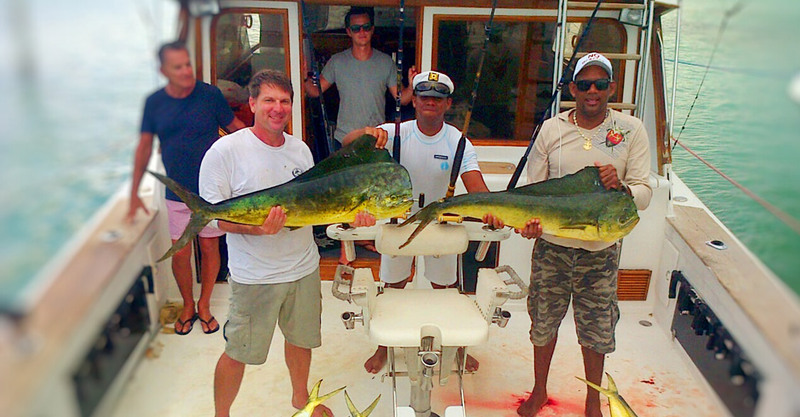 We have seven years of experience in Big-Game Fishing in the Dominican Republic. Our modern and powerful motor yacht is equipped with all the appliances for security, navigation, communication and comfort in the Sea. 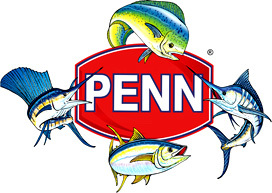 We are using 1st class fishing equipment: Penn International, Shimano with a large variety of lures and superior reliable tackle. As well, we bring fresh excellent quality bait. We hope that very soon you will join our great world-wide family of fishing fans! We are really looking forward to that and will be happy to share our experience and passion for big game fishing with you. 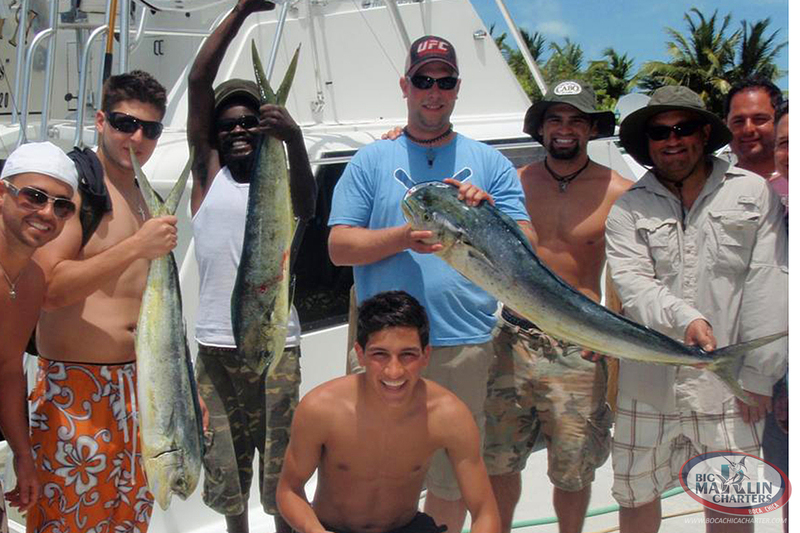 Our Captain Pako has 7 years of experience in trolling and knows local waters perfectly. 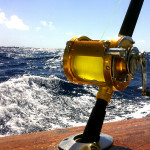 Deep Sea Fishing is an emotional experience, relaxing and healthy way to get away from the everyday routine. 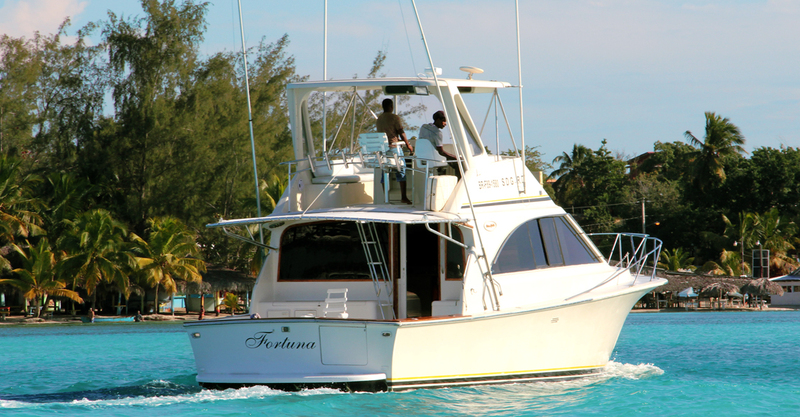 Our Offer Includes: Captain-guide, rent of the modern yacht Ocean Super Sport 42″ “Fortuna”, which has capacity of maximum 6 anglers on board for one fishing trip. All the security features: radio, GPS, life jackets. 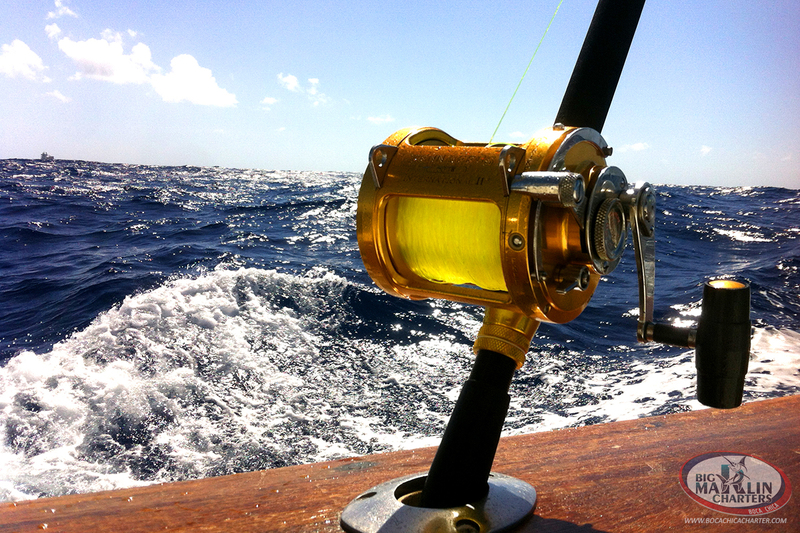 Fishing equipment: premium class quality rods and reels, live bait, lures and more…. ADDITIONALLY: we serve you breakfast, mid-morning snack, lunch, fresh fruit and cold drinks. 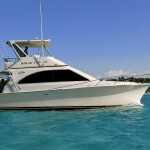 On-board we always have for you Drinks – Rum “Barcelo Gran Anejo”, Beer “Presidente” Light, Cola, Sprite, bottled water. Enjoy our delicious lunch from the grill – cooked in front of you – tender barbeque chicken with potatoes. 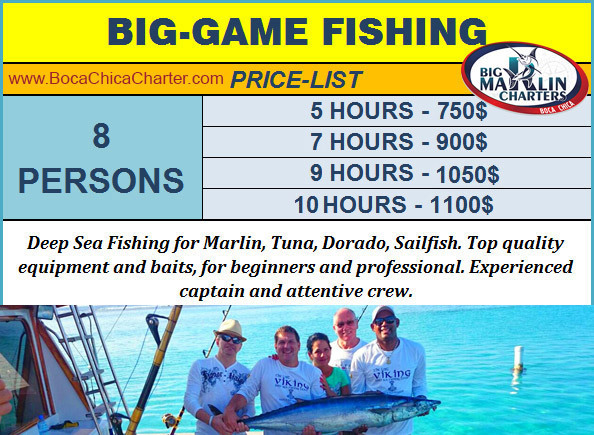 Big Game Deep Sea Fishing Punta Cana with Big Marlin S.R.L. is a spectacular event, so you might want to bring your family along, they will have fun! We have all licences for catch any fish. 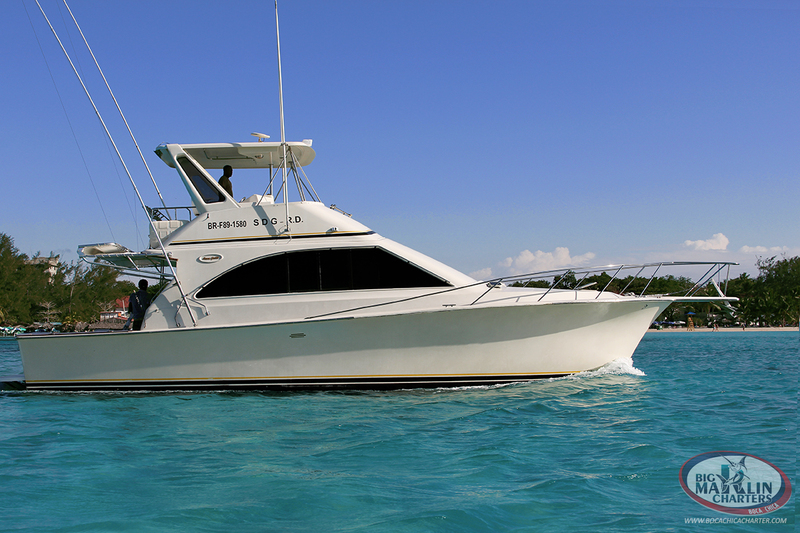 Private fishing charters with experienced Captain Punta Cana – Bavaro. 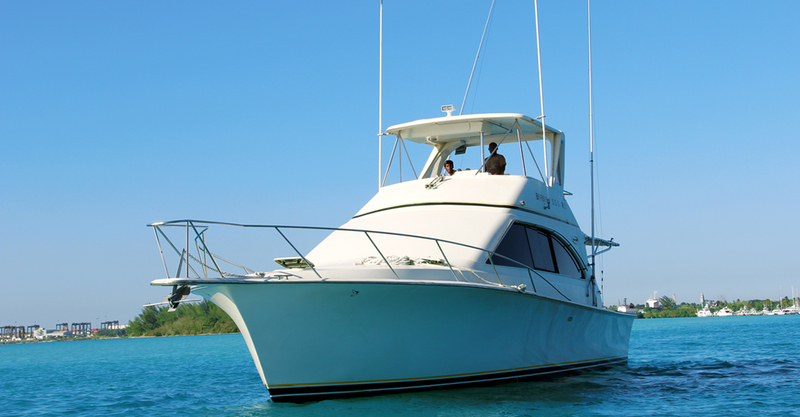 Enjoy offshore Big-Game sport fishing on board of perfectly equipped yacht, as we follow best world-wide traditions. OUR RECOMMENDATIONS: we suggest you bring a hat, sunblock, sunglasses, pants and long sleeve shirt, repellent, medicine against sea-sickness. NOTICE: we don’t allow on-board for fishing trips, due to safety precautions: pregnant women, children under 6 y.o., persons under alcohol or drug influence. IMPORTANT: fresh bait stays at the yacht after the trip. The CATCH can be cooked in Marina Makey restaurant or any other place by your choice. 7. Relax and enjoy your Fishing trip!